“Your Life is in Your Hands” – The story behind the lines in the palm of your hands! [tweetmeme source=”handresearch” only_single=false] Last month VoiceAmerica’s radioshow “Your Life is in Your Hands” presented an episode devoted to the palmar creases of the hand. UK hand analyst Lynn Seal was invited to talk with host Kenneth Lagerström about the mysterious ‘lines of the hands’. During the hour various aspects of the hand lines were discussed, including: the mystery of the ‘palmar flexion creases’, the prenatal development of the (major) hand lines in the early life of the embryo, line variations among ethnic populations, the differences between hand lines in the left and right hand, and how the hand lines can be used for different purposes in palmistry. Lynn explained very well that in time the hand lines can show significant changes; this simple fact might explain why the validity of ‘future predictions based on the hand lines’ are even disputed from within the palmistry community! Unfortunately the podcast of the show is nog longer available, but Kenneth has pointed out that the recording will become available at HumandHand.com in the near future. How to understand the major characteristics of the lines in the palm of your hands properly? 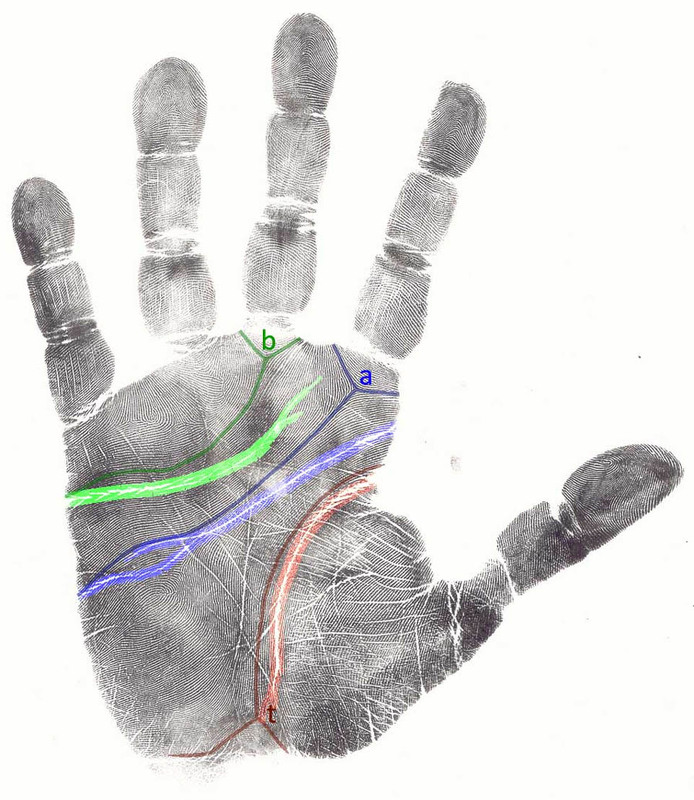 In modern palm reading (cheirology) the hand lines are not used for predicting the future; contrary the hand lines are recognized as ‘energy flows’ reflecting process in the body and the brain which related the various aspects of an indvidual, including temperament, personality & and interpersonal functioning. Contrary to what many believe, the development of the hand lines does not directly relate to the movements of the hands. 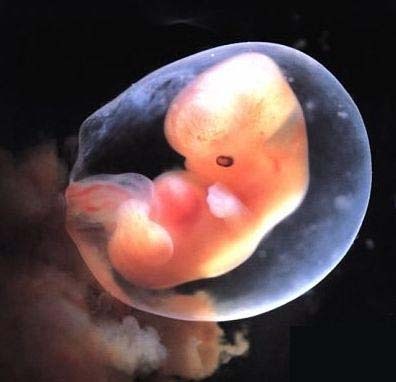 For example, the three major hand lines (life line, heart line and head line), start developing in the hand of the little embryo in the 2nd month of gestation – while the first hand movements do not occure before the 2nd half of the third month. Another indication is provided by the fact that usually the ‘passive’ hand (= left hand for righthanded people) shows more hand lines then the ‘active hand’ (= right hand for righthanded people). And often the hands of people who are active in jobs that require a lot of manual work, show less palmar lines than those who are active in jobs that are not featured with the use of the hands (such as social work). 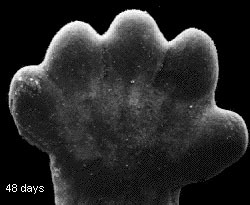 After about 7 weeks the life line starts developing in the hand of the embryo. Despite the fact that many palmists around the world – especially in Asia – still claim that the lines in the palm or our hands reveal information about our future, the truth is that within the global palm reading community there appears to be a growing number of debaters who actually question the validity of this claim. While traditional palmistry has merely been a matter of using the hand as an occult ‘tool’ – focussed on making (future) ‘prediction’; in the 20th century modern palm reading became more focussed on the issue of understanding human nature, by studying the psychological- & spiritual life of individuals. The most frequently asked question is probably: “what do my hand lines reveal?” Interestinly, the answer might actually depend on the person who is faced with this question! For example, a traditional palmist might point to your future, a modern palm reader might point of your brain, and a scientific hand analyst … might point to your genes! 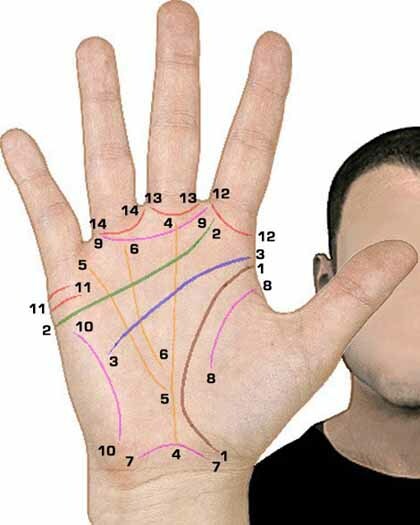 14 Palmar creases: an overview of the most common hand lines. • What does the presence of a ‘simian line’ reveal? • The story of the ‘Sydney line’: how it relates to the ‘simian line’! Palmist Theikpan Myint Oo reads hands in Myanmar. For those who believe that the lines on your hand form a map of your life, the palmists of Yangon can offer advice, consolation and, should danger loom, warnings. The shape, contours and colour of the palm of the hand and the length and pattern of the hand creases formed when it folds are a reliable guide to the person’s past, present occupation and preoccupations, and also their future. “The lines on your palm describe what kind of person you are and predict what trouble you experience at present,” says Daw Khin Yadanar Sint, who has made a career of reading the palms of people from all walks of life since 1993. She added that astrologers can tell a lot about a client by examining his or her hands. Even the colour and shape of a palm can hold clues, so that vegetable sellers have flat palms and rich and successful people have pink and fleshy palms. 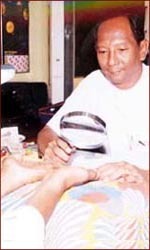 Daw Khin Yadanar Sint said every line on the human hand has a meaning. A person might travel many different paths during a lifetime and encounter many events that mark important stages in the journey. Her job is to advise on the right move at the right time to ensure success in work, or in love. Most people approach famous palmists and astrologers whose predictions appear weekly in local journals, hoping for a glimpse of the future.